James Ponsoldt's newest film, The Spectacular Now, based on the Tim Sharp novel, is a surprisingly touching, unglorified portrayal of life's everyday struggles as a carefree teen. Miles Teller (Footloose) gives the performance of his life in an understated, utterly likeable and charming 18-year-old hard partying teenager. It's a welcome throwback to thoughtful, "devastatingly sincere" young adult films of the 1980s. 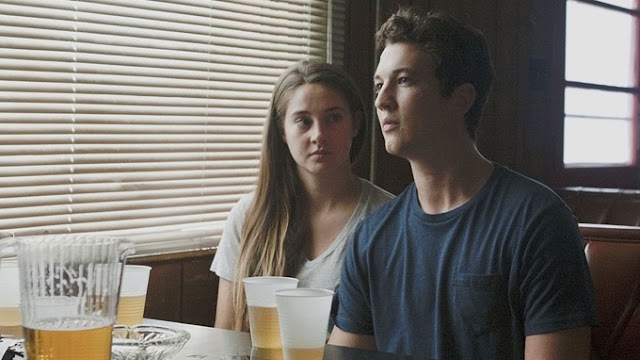 What's so refreshing about The Spectacular Now is its earnest and serious treatment of teen issues. The composition and execution of its material is starkly authentic but fascinating. High schoolers act and look like actual high schoolers with identifiable problems and motivations. The filmmakers tackle difficult material almost matter of fact-ly with soft touches and patient storytelling. This is a film made by its cast and acting talent. Shailene Woodley (The Descendants) is a revelation as she channels the bookish nerdy doormat girl (adorably named Aimee Finecky) with a heavy douse of intense vulnerability. Her charming presence and tender, naturalistic performance plays off Teller's boisterous Sutter Keely well. Brie Larson (21 Jump Street) gives a small yet effectively touching turn as Sutter's ex who sees early on the limits of his character. Jennifer Jason Leigh and a very different Kyle Chandler give interesting turns as Sutter's troubled parents and reflections of himself. Folks like Mary Elizabeth Winstead, Bob Odenkirk, and Andre Royo turn up as wiser adults to guide Sutter's journey. There's an insightful complexity to Sutter and Aimee's doomed relationship as his self-destructiveness and immaturity threaten their happiness at every turn in spite of a strong bond as they build each other up. It manages to avoid most teen clichés and stereotypes while being pretty devastating emotionally. The Spectacular Now succeeds in exploring real-life teen issues honestly and openly, never feeling false or artificial. Ponsoldt treats the material and its characters with a touching effectiveness as he frames the film entirely through its performances and strong writing (from the writers of 500 Days of Summer). It really does well in its story about teenagers dealing with the next step in their lives and struggling to define themselves and their relationships.